WASHINGTON DC, Jun 1 2018 (IPS) - The global nuclear nonproliferation system has always relied on responsible leadership from the United States and other global powers. The effort to create, extend, and strengthen the nuclear Nonproliferation Treaty (NPT), which was opened for signature 50 years ago on July 1, 1968, has succeeded, albeit imperfectly, because most U.S. presidents have made good faith efforts to back up U.S. legal and political commitments on nuclear arms control, nonproliferation, and disarmament. Beginning in 2003 when Iran was discovered to have a secret uranium-enrichment program, key European states, along with China, Russia, and later, the United States under President Barack Obama, put enormous effort into negotiating the complex multilateral deal to curtail and contain Iran’s nuclear program and to verifiably block its pathways to nuclear weapons: the 2015 Joint Comprehensive Plan of Action (JCPOA). But now, with his May 8 decision to unilaterally violate the JCPOA, President Donald Trump effectively has ceded the traditional nonproliferation leadership role of the United States, opened the door for Iran to quickly expand its uranium-enrichment capacity, and shaken the foundations of the global nuclear nonproliferation system. Trump’s decision to reimpose sanctions on Iran and any businesses or banks that continue to do business with Iran puts the valuable nonproliferation barriers established by the JCPOA at grave risk. If the accord is to survive Trump’s reckless actions, EU governments and other responsible states must now try to sustain it without the United States by taking bold steps to ensure that it remains in Iran’s interest not to break out of the JCPOA’s rigorous constraints. EU foreign policy chief Federica Mogherini said May 8 that “[a]s long as Iran continues to implement its nuclear[-]related commitments, as it is doing so far, the European Union will remain committed to the continued full and effective implementation of the nuclear deal. 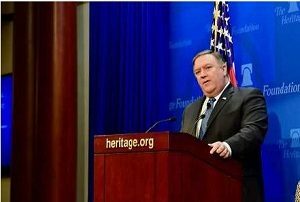 Europe Union states, as well as China and Russia, have little choice but to part ways with the Trump administration on the Iran deal because Trump has rejected reasonable proposals from leaders of the E3 countries (France, Germany, and the United Kingdom) to address his concerns and because his new “strategy” to pursue a “better deal” to prevent a nuclear-armed Iran is pure fantasy. To try to address Trump’s complaints about the JCPOA, the E3 worked in good faith for several months to negotiate a supplemental agreement designed to address concerns about Iran’s behavior that fall outside the terms of the 2015 nuclear deal, including its ballistic missile program and its support for radical groups in the Middle East. That effort failed because Trump stubbornly refused to guarantee to the E3 that if they entered into such an agreement, he would continue to waive nuclear-related sanctions against Iran. Trump administration officials say they will try to “cajole” the European powers and other states to re-impose even stronger sanctions on Iran to try to compel Iran to come back to the negotiating table to work out a “better” deal for the United States and a more onerous one for Iran. In the meantime, Trump is demanding that Iran must still meet the JCPOA’s nuclear restrictions and submit to its tough International Atomic Energy Agency monitoring provisions. Such arrogant bullying has no chance of producing a cooperative response from leaders in Tehran or in other capitals. Incredibly, the Trump administration, which is in the process of negotiating an agreement for civil nuclear cooperation with Riyadh, failed to respond to this alarming threat from the Saudi monarchy to violate its NPT commitments. Trump’s withdrawal from the JCPOA is also a body blow to efforts to strengthen the NPT system in the run-up to the pivotal 2020 NPT Review Conference. Statements from U.S. diplomats about how others should advance NPT goals will ring hollow so long as the United States continues to ignore or repudiate its own nonproliferation obligations. For instance, at the NPT gathering in May, U.S. representatives argued that progress toward a zone free of nuclear and other weapons of mass destruction in the Middle East suffers from a “lack of trust” and nonproliferation “noncompliance” by states in the region. Unfortunately, U.S. noncompliance with the JCPOA has only exacerbated these challenges. Trump’s decision on the nuclear deal has transformed the United States from a nonproliferation leader to an NPT rogue state. For now, the future of the hard-won Iran nuclear accord and maybe the NPT as we now know it will depend largely on the leadership of key European leaders and restraint from Iran’s.